This is the set-up for Temp Worker Assassins, worker placement-decking building, hand-manipulation game published following a successful Kickstarter campaign and a launch at UK Games Expo, 2017. It is designed to be played by between two and four players, aged fourteen and over, in roughly forty minutes. From one round to the next, players will send their assassins to the Forbidden Stationery Cupboard, the Really Spooky Recycling Area, and Malevolent R&D Department amongst others to gain offices supplies such as the Evil Pencil Sharpner, the Pointy Edged Clipboard, Not-So-Floppy Disk, and Hideous Highlighter Pen, all in readiness to launch an assassination attempt at a chosen target. The game consists of some one-hundred-and ninety cards, twenty Assassin Meeples (five of each colour), a Starting Player Marker, and a fourteen-page rulebook. Of the cards, forty consist of four identical decks, one per player. These are mostly Fairly Sharp Pencils and Reasonably Blunt Pencils, providing +1 or +0 Attack respectively. Even if a player has all of these in his hand, they are rarely sufficient to make a successful assassination attempt on a target, so better cards are needed. These come in the form of the Stationery Supply cards, of which there are sixty. Four of these are placed face up to form the available Stationary with the Stationery Supply deck nearby. There are forty Department Cards, ten of which will form the various locations in Bureaucrat Castle where a player will send his Assassin Meeples to gain more cards, improve his hand of cards, and gain other benefits. Forty-five Target Cards provide the victims for the players’ assassination attempts. Five of these are actually Typing Pool Zombies, which mostly stationary, are easier to assassinate, but worth fewer Victory Points. Three of these Targets will be available to assassinate at any one time, as will one Typing Pool Zombie. Together, the number of Department Cards and Target Cards gives Temp Worker Assassins a fair degree of replay value. The last card type in the game is the Turn Marker card. There is one of these for each day and they each provide a better bonus as the game progresses through the week. They are won by the first player to make a successful assassination attempt on a day and go into the player’s discard pile. Here is where it is worth targeting the Typing Pool Zombies as although they may not be worth points, a quick stab with a bunch of pencils might be enough to bump one off as soon as an assassin gets into the office and so get the Turn Marker card for that day. Lastly, there is the rulebook. This is nicely laid out and easy to read, but it is underwritten as some of the rules are not as clear as they could be despite the game’s relative simplicity. Turns are quite simple. Beginning with the Starting Player—who will change day-by-day—the players take it in turn to place one of their assassins on Department Card or Target Card to make an assassination attempt. The Department Cards provide several actions, including Clear (discard and refresh the Stationery Supply cards), Draw (draw cards from a player’s deck), Gain (Take a face-up Stationery Supply card), Research (take cards from the Stationery Supply deck, add one to a player’s hand and discard the rest), and Trash (remove a card in your hand from the game). Some Department Cards provide just one of these actions, but others give a mix of them which all must be carried out. Other Department Cards provide a bonus to weapon types during assassination attempts amongst other benefits. This being a worker placement game, it means that it is possible to block access to a Department Card for other players and it does mean that as a turn progresses, there will be fewer Department Cards for a player to put his assassin meeples on, giving him fewer choices. That said, this is offset by the fact that some Department Cards have multiple spaces. Once a player feels he has enough Stationery Supply cards to hand—there is no hand limit—he can make an assassination attempt. This is not a simple process, as it does require a player to chain his Stationery Supply cards in order to have the greatest effect—learning how to do this effectively is one of the game’s challenges. So Scaring Staples grants ‘Up to 2 Staplers get +2 Attack’, so a player needs to have another two Stapler cards in his hands and they will also have their effects as well as an Attack value. This allows for a certain degree of deck design, player trying to Gain cards from the Stationery Supply that will make a particular card work. In many cases, a player will also be discarding and drawing cards from his deck. In the early stages of the game this may be an issue because a player is unlikely to have particularly powerful cards in his deck, but later in the game, if he has been able to raid the Stationery Supply cards, he will certainly have better cards to draw from. One notable difference from a great many deck building games is that when taken from the Stationary Supply, the cards do not go into a player’s discard pile, but his hand. This means that he can prepare for an assassination attempt on his turn as much he might have to reply upon what is in his deck. If successful, the assassinated Target card goes into the player’s victory pile. Some Target cards provide bonuses in addition to their Bounty value. After an assassination attempt, whether successful or unsuccessful, an assassin meeple is sent to Security. (He is not arrested, fired, or anything, but can return to work the following day—it appears that Bureaucrat Castle is really keen on its temps working out their period of employment.) The player discards both his hand and the cards played as part of the assassination attempt, draws a new hand of five cards, and continues play. Once everyone has played all of their assassin meeples on a day, it ends, they clock off, and a new day begins with a new Turn Marker card. This continues until the end of the fifth turn—or Friday—when everyone clocks off and the game ends. The player with the most Bounty points gained from assassinated Targets is the winner. Physically, Temp Worker Assassins is a very nicely presented game. The cards are sturdy enough and their instructions easy to read. The artwork though, especially on the Target Cards is very good—if only it had been bigger! The rulebook is somewhat underwritten, but does include a good example of how an assassination is supposed to work. It would have been nice if the assassin meeples had been a bit more thematic, but you cannot have everything. 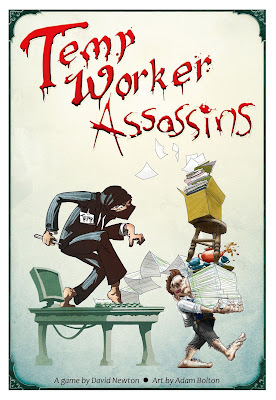 Temp Worker Assassins not only has great artwork, but it has a fun theme too. A lot of thought has gone into the names and looks of the Target Cards as well as the name of the various offices and departments at Bureaucrat Castle (you may not have actually worked in some of these locations, but it probably feels as if you have). Once you get the hang of it, a game of Temp Worker Assassins should play faster than the suggested forty minutes—which feels a bit long anyway. This should only take the one play through, but after that, the game’s humour, and the replay value in the variety of the Department and Target cards will bring Temp Worker Assassins back to the table.